This past Thursday, two bomb blasts in a residential district of southern Beirut took the lives of at least 43 people and wounded over 240 more, according to Reuters. The area is a controlled by Hezbollah, a Shi’a Islamist militant group, and the suicide bombs responsible has been claimed by the Islamic State of Iraq and the Levant (ISIL). The bombings seem to be linked to the ongoing Syrian civil war, as Hezbollah has been fighting ISIL and other Sunni rebel forces alongside forces deployed by Syrian President Bashar al-Assad. Russia’s air campaign backing Assad at the end of September has resulted in heightened clashes, with Iran and Saudi Arabia backing opposing rebel forces in both Syria and Lebanon. Thursday’s blasts were the first targeting Lebanese Hezbollah territory in over a year and came back-to-back, hitting a Sh’ia community center and bakery, both in the busy commercial and residential areas of Borj al-Barajneh. The explosions occurred at around 6 p.m., the local rush hour, seemingly to maximize impact. A hospital run by Hezbollah was also in the vicinity of the attacks, and medics rushed to the scene. ISIL supporters posted a statement online in which the group took responsibility, stating that its members first placed a bike with explosives in Borj al-Barajneh. When the bike exploded, it drew onlookers who were then subsequently killed or wounded upon the detonation of a suicide bomber. The attacks may have been meant to be far worse. 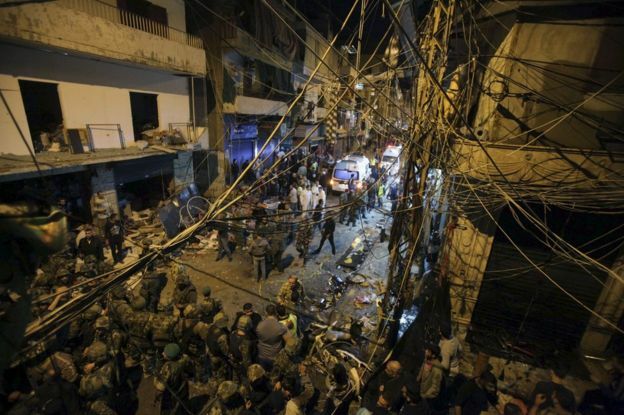 According to the Lebanese army, three bombers were found dead, one with a belt of undetonated explosives. Hezbollah responded with a statement that it would continue to fight against “terrorists,” promising a “long war” against enemy forces. While the residential area targeted has a majority Shi’a population and many Hezbollah supporters, the area is also home to many Palestinian and Syrian refugees who are largely Sunni, as well as Christians. Can You Tell the Difference Between a Presidential Candidate & the KKK? Seems that sectarian strife in coming to Lebanon with more venom with the advent of ISIL.